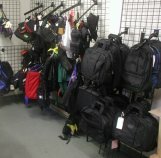 Founded in 1991, Sunlight Sewing, Inc. is a contractor and manufacture of (PPE) Personal Protective Equipment for Search and Rescue (SAR), Firefighters, Secret Service, Custom Cases for Computer Notebooks and many more items. With over 20-year experience in producing all different kinds of products along with our philosophy of high standards, that promote consistent service, continuous self-improvement and a focus on customer satisfaction has allowed us to keep 100% of our customers from seek other competitors. Sunlight Sewing, Inc. is located in Tukwila, Washington. The factory has three production lines with state-of-the-art equipment and employs over 30 workers. Under modern and innovative management, the factory can produce large amounts of goods per month. Our products are sold all over the world and used by people who have come to expect the best in all they buy and use. 1. We are always focused on superior quality of sewing construction. 2. We are always responsive to our customers needs. 3. We are always focused on the quality control of production flow including the inspection of products. Besides of the mentioned above, we also enhance our service level, keep our promises to our customers, and complete our contracts all the time. That is why we are able to gain trust and loyalty from our customers. As our service philosophy states, we can meet customer?s demands for prompt and speedy delivery. And we welcome you to browse our site and feel free to contact us at all time. Company Name: Sunlight Sewing, Inc.